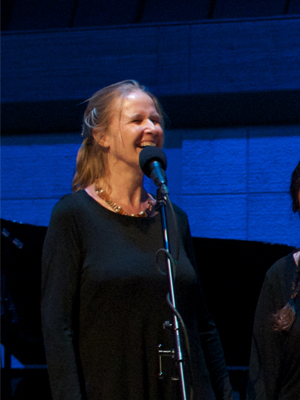 Cornelia Funke appeared on Show 301, recorded in San Francisco, CA, on February 14, 2015. Cornelia Funke (narrator/author) Following a post-graduate course in book illustration at the Hamburg State College of Design, Cornelia Funke worked as a designer and illustrator of children’s books. But disappointment in the way some of the stories were told, combined with her desire to draw fantastic creatures and magical worlds rather than the familiar situations of school and home, inspired her to write her own stories. As a reader, Funke has always loved good fantasy, particularly such modern classics as J.R.R. Tolkien’s Lord of the Rings, C. S. Lewis’s Chronicles of Narnia, and J. M Barrie’s Peter Pan. Funke’s own success is now international, demonstrating the universal appeal – and power – of her storytelling. When a little German girl living in Britain demanded to know why her favorite author’s books were not available in English, the Publisher and Managing Director of the Chicken House, Barry Cunningham set about the task of tracking down Funke’s latest title at that time, Herr der Diebe. He published its English translation, The Thief Lord, and it immediately entered the New York Times bestseller list, where it climbed to the #2 position and spent more than twenty-five weeks. It also appeared on the USA Today bestseller list and won the prestigious Mildred L. Batchelder Award for the best translated children’s book of the year; the Book Sense Book of the Year Award; and many other accolades. Funke followed up The Thief Lord with a string of enormously successful novels. Dragon Rider, her popular tale of a dragon’s search for home, has been read by more than a half million American children. Inkheart, the first title in her acclaimed trilogy, has been adapted into a major motion picture starring Brendan Fraser, Paul Bettany, and Oscar–winner Helen Mirren. Both Inkheart and its sequel, Inkspell, spent months on the New York Times bestseller list and garnered numerous awards. Inkdeath, the highly anticipated conclusion to the series, will be published in Fall 2008. For younger readers, Funke has also written the popular Ghosthunter series, Igraine the Brave, When Santa Fell to Earth, and such beloved picture books as The Princess Knight and Pirate Girl. To date, there are more than five million copies of her books in print in the United States alone. In 2005, Time magazine named Cornelia Funke among its “100 Most Influential Men and Women.” The author lives with her family in Los Angeles, California, in a house filled with books.